Mark Lowenstein is a lifelong runner who loves to discover new neighborhoods, step by step, climbing hills, assessing vistas. So upon moving to Brookline two years ago that's exactly what he did. Now, Lowenstein has turned that love into two self-published books that map out memorable runs in and around Brookline and Boston, including a few Newton jaunts. "Great Runs in Boston" came out last week, while "Great Runs in Brookline and Vicinity" has been on the shelves since February and is a hot seller at local bookstores. "We've sold a few hundred already," said Dana Brigham, manager of Brookline Booksmith, where the $14.95 book has been at the top of the bestseller list since its release. "We stuck them by the register, and out they flew. I guess we have tons of runners." It is also selling nicely at Newtonville Books, according to owner Mary Curtin. Lowenstein said he got the idea for the Brookline book from a little guide to his new hometown's historic paths, self-published by resident and urban planner Linda Pehlke. Lowenstein so loved the book's layout that he hired its designer, Robert Pehlke, Linda's ex-husband, to work on his own books. He figured that a town like Brookline (and vicinity) has a fairly transient population that might be looking for a guide to scenic and safe running routes. The 88-page, spiral-bound book on Brookline has 25 routes, from 3 miles on up. Several venture into Newton, including Newtonville via Bellevue and Cabot streets, Chestnut Hill, Beacon Street and Commonwealth Avenue to Route 16. Lowenstein laid out the runs with multiple starting points, appealing to the jogger who doesn't want to drive before exercise. 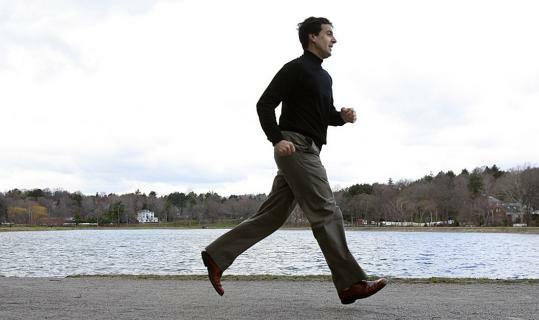 He also outlined runs into the Emerald Necklace chain of parks, and along the Charles River. "I kept off of the main roads, except for Commonwealth Avenue with the carriage lane," he said. "I think the book may help people discover areas they might not think of: the VFW Parkway is lovely for running, along with the Arboretum and Corey Street, with two cemeteries, beautiful hills, gorgeous trees." The Boston book, which sells for $17.95, has more than 30 runs. It covers every major neighborhood, including routes that he dubbed "hidden gems," such as the Gourmet Gallup, through the South End; and Ocean Spectacular (East Boston). Both titles are available through a website set up by the author, www.greatruns.net. Lowenstein will be showing off the routes in person as part of a weekly course offered by the Brookline Recreation Department on Thursdays at 6:30 p.m., starting May 21. He's also scheduled to mark tomorrow's running of the Boston Marathon with a book-signing event, from 11 a.m. to 3 p.m., outside the Brookline Booksmith, which sits on Harvard Street a half-block north of the race's route. The books haven't turned a profit yet, but that's OK, Lowenstein said: "It's my way of contributing to the community." He subsidized their printing through his day job, as managing director of a wireless-communications consulting firm. Lowenstein said he did his writing at the Washington Square Starbucks in Brookline, starting around 5 a.m. and continuing until 9, so as not to wake the household, which includes his wife, their two children and the family dog. The benefits of writing, publishing and distributing his books outweighed the challenge, he said, adding, "I like having control over my own domain." Still, it left him little time for his favorite pastime. "That's the irony. I've been sitting." Now that the Boston guide is finished, however, he'll be back running his routes again.